Ok. 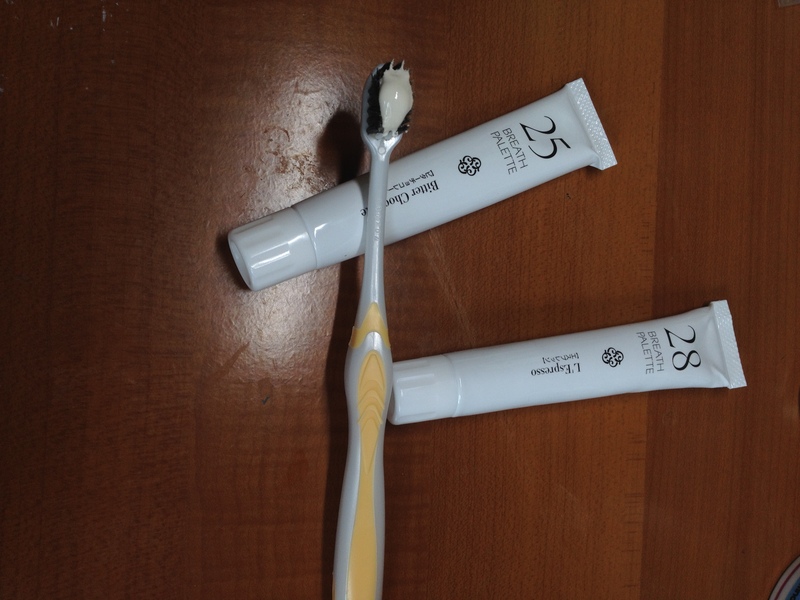 It may seem weird that I’m talking about toothpaste in this blog. But hey, it’s a Japanese brand toothpaste that exhibits the elegant simplicity and attention to detail in a most Japanesque way; so I think it’s justified! I chanced upon this product while shopping in Tokyuu Hands (here for the SG website, here for the Japan website). I absolutely love this store to bits. Love the goods they sold there. Granted, some are pricey in the way Japanese + imported goods are, but they are just so hard to resist. Good quality, great design, over the chart cuteness… I’ve probably spent too much time (and money) in this store for my own good but… that’s just how attractive it is. Especially love their selection of pens and stationary. Way more than the regular bookstore in Singapore, AND, the multi colored pens are arranged with a Japanese precision and neatness, that makes shopping just so much more aesthetically pleasing. 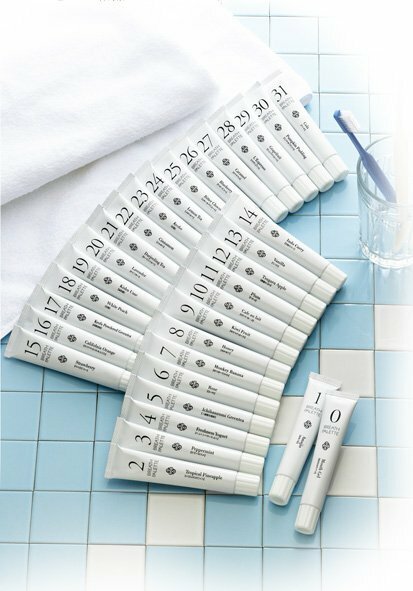 True to it’s world renowned culture of simplicity, the breath palette toothpaste are packaged in plain white. The design is minimalistic, and I must admit, it took me a while to deduce that ‘breath palette = toothpaste’. And what a unique toothpaste it is, coming in 31 different flavors. One for each day of the month – their website advertises. I couldn’t resist and decided to pick some flavors for myself. It was hard to pick. I love peppermint and cinnamon, but in the end I decided that peppermint is sort of similar to the usual mint flavored toothpaste available, and decided to leave the cinnamon for next time. So I walked away with flavor no. 25 – bitter chocolate, and flavor no. 28 – L’Espresso. I don’t usually drink coffee because I get a headache when I have too much caffeine, but I figured it’ll be fine since I don’t swallow my toothpaste. Plus, a little coffee (flavoring) might help wake me up in the morning. 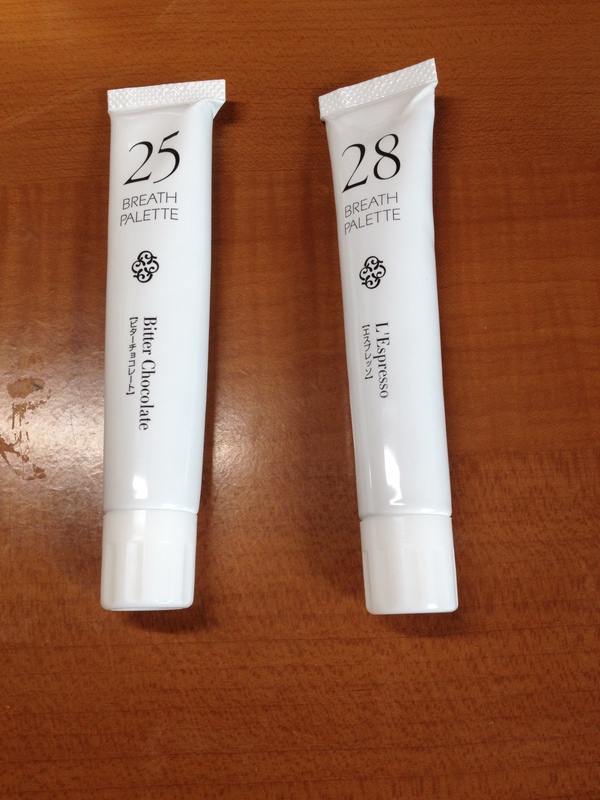 Breath palette toothpaste uses microbeads and doesn’t foam up. I was in for a surprise when I used the toothpaste. It doesn’t foam up like your usual Colgate. Instead, they use ultra-fine microbeads with Xylitol to clean up, and natural extracts for the flavoring. It certainly felt weird at first, without the foam. But I got used to it instantly. I was glad even – I hate foam. I’ll be honest about it. Every time I brush I have to be careful not to get the foam too deep into my mouth (especially when rinsing out), because otherwise my gag reaction would kick in and my eyes turn teary as I choke and try to spit the foam out. With this, plus the cool flavors, I may actually start looking forward to brushing up. On the flavors… personally I like the L’Espresso more than the Bitter Chocolate. The latter is, by the way, not bitter at all. I’d say it was sweet even, and came with a strange hint of mint. I don’t dislike it but I think I’d try something else the next time. The L’Espresso on the other hand was great. I didn’t expect to like it all that much since I’m not a coffee lover, but it tastes like coffee, and in a subtle but not easy to miss way. It had just the right amount of flavor for my liking. 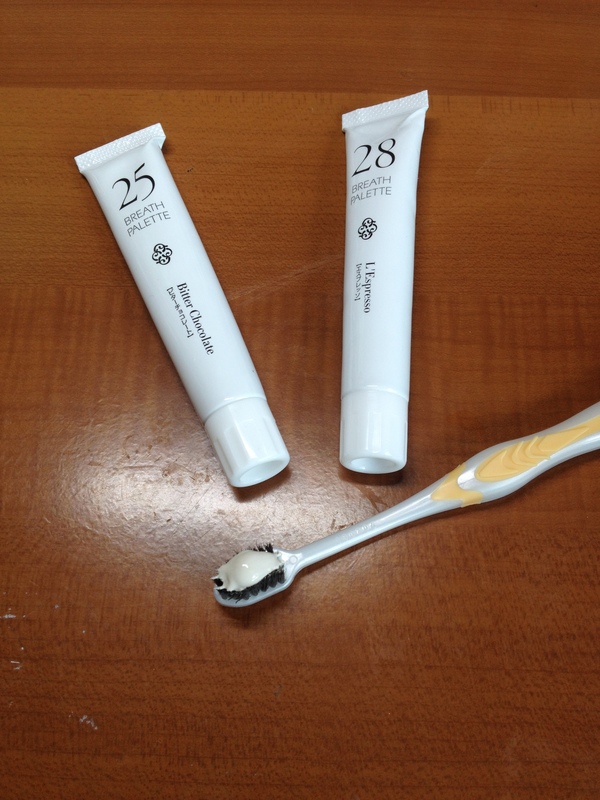 The toothpaste comes in a 25 g tube. Not a huge tube really. You don’t need much for each brush, half of what is show in the photo is more than enough. I squeezed on more for photo taking purposes, but the paste isn’t a really ‘hard’ paste that stays in shape as with the usual variety, so it’s in an ugly lump as seen in the picture. Still, it remains to be seen how much mileage I can get with a tube though. Plenty of interesting flavors, I’m sure you’ll find something to your liking. The yogurt, cinnamon, cola and caramel all looks attractive to me. I’ll like to try them next time. I got mine for SGD 4.00 a tube, and they sell for 200 yen (before tax) in Japan. They are also available on Amazon – sold individually or as sets.